An initiative of FIRST PITCH: The U.S. Manipur Baseball Project, to which Hun-tré! is affiliated, the Major League Baseball International Coaching Camps are part of this international based effort to help Manipuri baseball teams and establish baseball as a professional sport. FIRST PITCH is a non-profit venture established in January 2005 in New York. The long-term objective is to establish in Manipur, where the game is already widely played, a much-needed and timely center for baseball in India. 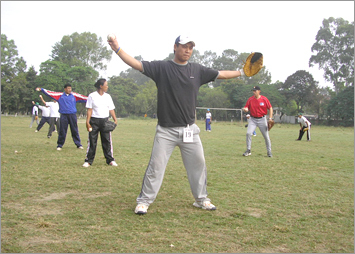 The third Major League Baseball International Coaching Camp will be held in Imphal, under the auspices of the Ministry of Youth Affairs and Sports and Hun-tré!, from June 4-11, 2010. The English translation of M. K. Binodini's play "Asangba Nongjabi" by L.Somi Roy is now available on discount at NE-Bazaar.